Autodesk presents OlilO, A unit of SrinSoft USA Smart City BIM Initiatives at Autodesk Future's Forum - Abu Dhabi. OlilO, SrinSoft's Middle East division is proud to be a part of Autodesk's UAE Smart City Project initiatives by developing the online BIM e-Submission and BIM e-review systems. Autodesk had recently hosted its Future's Forum, an event to discuss emerging technology in design and architecture in Abu Dhabi and showcased how future technologies will disrupt and change the way that key sectors operate. Mr. Hassan Helmy - Regional Manager, Autodesk Middle East briefed the attendees about upcoming Building Information Modeling initiatives including the launch of BIM e-Submission and BIM e-review systems that OlilO is developing as part of the recently launched Zayed Smart City Project, a five-year plan for Smart Cities and Artificial Intelligence. SrinSoft executive team headed by Ram S Hari - President and CEO, Sudhakar Kadavasal - Managing Director, OlilO, Srini Venkat - Vice President - Engineering and Saran Vijay - Vice President - Operations met with the Abu Dhabi Municipality Authorities headed by Mr. Khalfan Alnoainmi - Executive Director Town planning and Mr. Hamad Alrashedi - Head of Addressing Unit to discuss on the support offered by OlilO on the UAE Smart City Project initiatives. OlilO is proud to be an official sponsor at the 6th Annual BIM Conference 2018 - Dubai, UAE. We invite you to join us at The BIM Conference on April 29-30 at the Habtoor Grand Resort, Autograph Collection, Dubai, UAE. It's time to meet the BIM Experts in the Industry! Join us at the BIM Conference 2018! Join us to discover the best ways to work, what the future holds, and how to stay competitive. 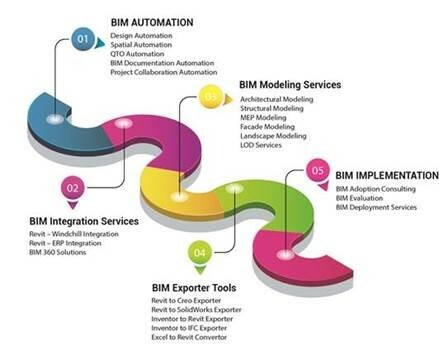 Learn from our experts on the latest advancements in BIM Modeling, BIM Automation, BIM Implementation and BIM Integration techniques. Be sure to stop by our booth and say hello to our team. See you there!